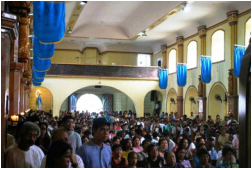 The Congregation gathers to thank God for the blessings of the past and prays for more blessings and guidance through the intercession of the Blessed Mother. Rev. Fr. Alain P. Manalo, parish priest of the Our Lady of the Way Parish (Magallanes, Cavite), and a native of Rosario presides over the celebration together with Rev. Fr. Gilberto L. Urubio, our parish priest, Rev. Fr. Jojo Abueg, another Rosarian, and Rev. Fr. Joel Rosales. Rev. Fr. Gilbert L. Urubio, our parish priest, acknowledges the efforts and support of the community and encourages everyone to make the fiesta truly an experience and celebration of faith! The 'Salve Regina' led by Rev. Fr. Gilberto L. Urubio is the community's tribute and show of devotion to the Blessed Mother. The Virgin on her grandly adorned 'andas' as she leaves the parish Church to 'visit' her domain! Uttering a prayer through dancing and merry-making is a feature of the traditional caracol. Archangel Raphael, lead us to God! 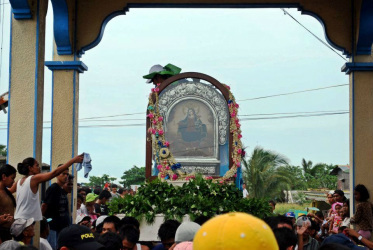 As customary, the image of the Archangel leads the pack of caracol devotees. 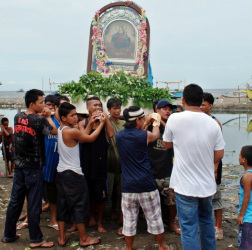 By the River of Tanza where the Virgin is brought to be lowered to a lunday on her way to the coastal waters of Rosario. The adulation, merrymaking, dancing and fun gets on its height even under the scorching heat of the sun... part of the sacrifice that a caracol devotee has to contend with. By the bank of the River of Tanza where the Tejero Convention site is, the shouts and cheers can be deafening. Caution is most needed at this point to make sure that the Virgin gets on the boat in one piece. ... she is ready for the sea! There is something unexplainable and mysterious in this experience! Seeing and hearing the devotees cheer and dance by the Band's dance-able music revs up the whole celebration. It is quite a privilege and honor for a devotee to be in one and the same boat as the image of the Blessed Mother! 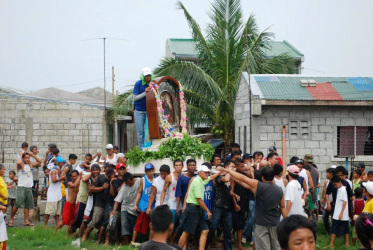 The fluvial procession is an expression of the fisherfolks' gratitude to God for the bounty of the sea... it is also a way of 'blessing' the sea which is a cradle of life! The number of basnig and other smaller vessels reaches as many as a hundred or more! Wet or what... fisherfolks know how to take care of the Virgin! And the band played on... and on... and on! Last hurrah before bringing the Virgin home!